Photo courtesy of Motorola Inc. Commercial, Government and Industrial Solutions Sector (CGISS). Motorola’s Commercial, Government and Industrial Solutions Sector (CGISS) is the leading worldwide supplier of two-way radio communications including radio networks, systems, products and services, and integrated communications and information technology solutions. Customers include fire, police, and public service organizations; governments; and businesses. Headquartered in Schaumburg, Ill., CGISS has facilities in the United States and around the world, including Africa, Asia, Europe, Latin America, and the Middle East. 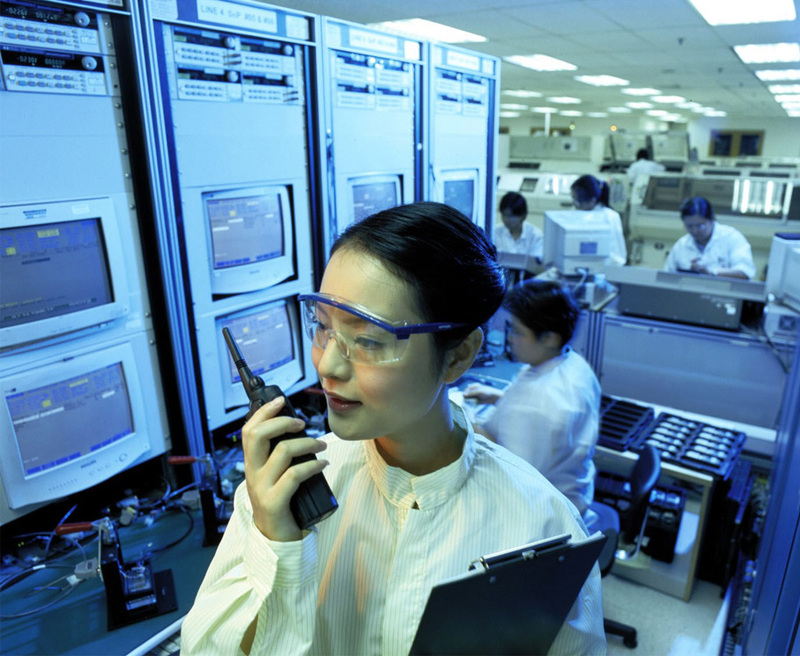 Approximately 14,000 associates worldwide support the CGISS mission to “enable customers to achieve their mission and improve their operational performance with integrated information and communication solutions.” CGISS products and services are delivered through an integrated structure that includes direct sales; extensive dealer, integrator, and service networks; customer support organizations; and “Motorola OnLine,” an extranet that provides customers and partners with self-service capabilities to order, accept, and ship products. In 2001, CGISS reported sales of almost $4 billion. Since 1999, strong financial performance relative to competitors is evidenced by: CGISS’ improved cash flow as a percent of revenue, more than 20 percent versus an average of 5 percent for telecommunications organizations; and a return on assets of 7 percent versus a negative average for telecommunications organizations. CGISS has maintained its number one position largely through its broad portfolio of radio systems and services that have a global reach, customer intimacy, operational excellence, and technological supremacy. All associates pay close attention to building and establishing trust; embracing quality; keeping employees, products, and services customer focused; and developing and maintaining strong relationships with customers, suppliers, and partners. Employee productivity, measured as sales per employee, increased 32 percent over the 1999-2002 period. Over the past three years, overall customer satisfaction and repurchase/recommend satisfaction levels have exceeded 88 percent. Since 1999, CGISS has had a 7 percent return on assets versus a negative average for the telecommunications industry. CGISS recycled 57 percent of its non-hazardous waste and has reduced emissions by 88 percent since 1996. CGISS demonstrates that corporate responsibility and integrity and marketplace success can go hand-in-hand. From its values statement, which emphasizes uncompromising integrity, to global policies and practices designed to ensure all operations adhere to the most stringent requirements worldwide, CGISS has integrated ethical behavior and respect for all people into its daily operations. CGISS’ commitment to uncompromising integrity underscores the standards of individual behavior that are inherent in the Motorola Code of Conduct. In this code, Motorola has created a corporate climate that emphasizes the need for each employee to demonstrate integrity both in word and action. CGISS is recognized around the world for its environmental, health, and safety efforts. When CGISS operates in countries that have less rigid regulations and standards, it applies and adheres to the more stringent U.S. regulations. In recognition of its efforts, nine sites have received the U.S. Occupational Safety and Health Administration’s highest award—the Voluntary Protection Program (VPP) Safety Through Accountability and Recognition (STAR) award—given to sites that demonstrate superior safety and health programs. One one-hundredth of 1 percent of eligible sites in the United States earned this award. CGISS builds “customer intimacy” into all of its processes to involve customers and other stakeholders in the design, development, and implementation of products and services as well as in CGISS’ strategic planning efforts. Through a system of aligned organizational objectives, scorecards, and personal commitment plans, CGISS integrates and deploys customer needs to all employees, who are evaluated on their success at meeting these requirements. The CGISS Performance Excellence Scorecard process helps CGISS set key strategic initiatives, establish clear priorities, and align efforts to execute and deliver on-time customer solutions. All business processes are linked to key strategies, focused on results, and designed to create value for key stakeholders. Performance Excellence Scorecards that communicate CGISS’ values, short- and long-term directions, and performance expectations are disseminated throughout the organization and are used to measure success. In turn, Scorecards are used by managers and employees to develop Personal Commitments. Through the Personal Commitment process, managers, teams, and individuals focus on the actions needed to satisfy customers, meet business goals, and achieve professional satisfaction. The Performance Excellence Scorecard and Personal Commitment process help associates make the connection between their individual efforts and the organization’s success and rewards individuals for their commitment to helping the organization achieve its goals. CGISS’ customer initiatives pay off. Over the past three years, overall customer satisfaction and repurchase/recommend satisfaction levels each have exceeded 88 percent, and from 1999 to 2001, customer service satisfaction levels increased from 85 percent to 99 percent satisfied or very satisfied. In addition, customers rate CGISS as the best-in-class radio manufacturer with perceived quality ratings at least 21 percent higher than its closest competitor. Strong product quality, reduced cycle time, and increased productivity also are key to ensuring this satisfaction. For example, CGISS’ product defect rate is only 52 parts per million, or 5.38 Sigma. Manufacturing cycle time (book to bill) for subscriber equipment improved 26 percent from 1999 to 2002. Additionally, employee productivity, measured as sales per employee, increased 32 percent over the 1999-2002 period. CGISS’ worldwide and highly complex business requires extensive systems for gathering, integrating, and analyzing information as well as managing its many processes. CGISS uses a state-of-the-art, fully deployed intranet data and information system to gather, integrate, share, and review all business and operational information, including organizational capacity and supplier information. This is the primary means by which CGISS shares data and information with employees, customers, and suppliers and ensures organizational learning and knowledge management. The system includes tools and services designed to facilitate analysis and review across all groups, functions, and regions. A fully aligned and integrated process management tool, known as the “M-Gate” process is used to help make decisions about designing, testing, and implementing new products, services, and features. This fully deployed process includes 15 “gates” or phases to systematically incorporate customer and market requirements; organizational capabilities, including human resources; and return on investment analysis to ensure that all stakeholder needs as well as organizational objectives are considered. To get to the next gate, the proposed product, service, or feature must pass strict entrance and exit criteria. In addition to the M-Gate process, process management initiatives are embedded throughout the organization’s approaches to managing supplier processes as well as business support processes, including human resources, finance, marketing, strategic planning, and customer relationships. These processes all are systematically evaluated and improved and aligned to key organizational objectives.